So I went to the grocery store Kroger to buy some random item at some random hour of some random morning last week. And even though I give Kroger nearly all of my food buying business, they insisted on insulting me. I spend dozens of dollars there and this is the thanks that I get. Now, I wasn't insulted by an employee per say. I'm not sure that the self checkout machine counts as an employee. Self checkout isn't exactly a robot from the Jetsons so I don't think it has feelings or is self aware. Even so, I used to think it was a nice machine. It was still morning, so knowing that I was hungry for breakfast it gave me a coupon for syrup, and after that cereal. It was the next two coupons that were insulting; tampons. 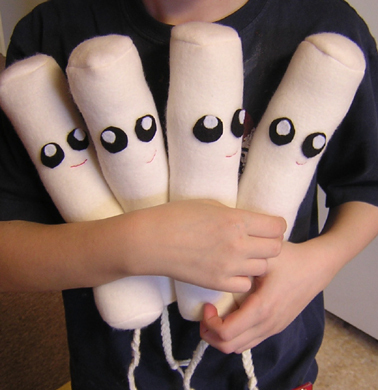 Tampons? That dumb thing was trying to call me a girl! I may be taking my dozens of dollars in yearly business elsewhere. It's Wednesday so I did what I do every Wednesday night, I went to Refuge Coffee Bar for Karaoke night. I love Karaoke night. The singing isn't necessarily great. Some is good, some is bad and some is ugly. But it's Karaoke so who cares. Tonight it was a packed house and I did something that I said I would never do, I sang Karaoke. Now don't get me wrong, I sing, I sing a lot. I sing in the car, I sing in my house, I sing in the Bathtub or while I'm walking down the street. I even dance, when Miley Cyrus tells me to to move my hips like yea, I do. But Karaoke in front of a crowd is a bit different. If there is one thing in life that I am positive of it is this, I can't sing. Now this wasn't the first time I've ever sang Karaoke. There was one occasion many years a go where, at a New Years Eve party, I tied my shirt into a belly shirt and sang some Britney Spears. Tonight I took it to the next level with some "Single Ladies" by Beyonce. And let me tell you, I butchered that song like it was my job. If that song was a cow it would have been a McDonalds double cheeseburger by the time I was finished with it. It could have been worse though, I could have been wearing black spandex. At least I had some very talented back up dancers. So I spent my entire day trying to get my computer to work. There's nothing worse than computer problems. Well maybe being stranded on a life raft in the middle of the ocean for 72 days would be worse. I watched a documentary last night about a guy who that happened to. As I was watching him try to figure out how to use his water making device I couldn't help but to think that I somehow understood his frustration. Except not really. If my computer doesn't work I loose money but I don't die a slow and agonizing death. I guess there are worse things than computer failure. "If God has a plan for everyone's life than how come Lindsay Lohan is in rehab?" On the weeks when I'm not leading Elementary kids church I like to sit in on the Middle School class. Middle schoolers are goofy. They giggle a lot and they say a lot of silly and ridiculous things. But in the midst of all the silliness Middle schoolers are constantly absorbing, learning, and wrestling with what they are being taught. And although it may come as a surprise to some, Middle schoolers have deep thoughts. This particular question really struck me. "If God has a plan for everyone's life than how come Lindsay Lohan is in rehab?" Why? 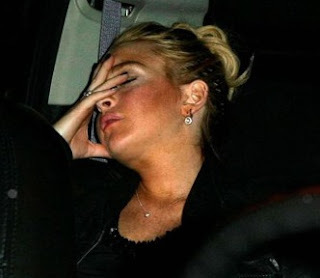 If God has a plan for Lindsay Lohan's life than why is she addicted to drugs? If God is all powerful than how come he is allowing Lindsay Lohan to destroy her life? Is that part of God's plan? If so that really sounds like a terrible plan. Does God's perfect plan for us included imperfection? Why indeed? When I was a kid I used to have the reoccurring dream that I lived in the church. These weren't exciting dreams. They would generally go something like this. I would be at the church and I would realized that I forgot my shoes so I would walk to the other side of the building and get them. And that was pretty much it. Now, I don't have those dreams any more. No that's not true. I should say I don't have those dreams with the same frequency as I did as a child. I have however developed what I consider to be a super power. I can find my way through the church building without turning the lights on and without being freaked out by all of the strange noises that this place makes. I don't like turning all of those lights on because then I just have to go and turn them all back off. I even managed to make it from the basement to the third floor and half way down the hallway with my eyes closed. I am also sad to report the church candy drawer has run dry, there are no donuts leftover from the the leadership meeting sitting around and whoever used to stock the freezer with freeze pops has apparently quit. Wait, I had better double check that last statement... walk walk walk, , no wait, I take that last part back. The key to eating a freeze pop is to tap it with a hammer a few times to get it all nice and smooshy. I don't have a hammer on me so I have been reduced to using my hands. Hmmmm, I had better eat this freeze pop and get back to work. - "My kids can tell the difference when I buy any toilet paper that's not Charmin Ultra Soft. My kids are toilet paper savants." - "This one time I got stopped at the airport because the scanner kept going off. It was kind of embarrassing because I have piercings that I don't want my kids to know about and I was afraid that that's what was setting it off. Luckily it turned out to be my bra." - I got an email about a party that I was attending that stated "I'll pick up the usual kids/Dan and adult beverages." kids/Dan beverages, well that's one way to put it. - "Yea, Frank quit smoking so now he chews on hard candy all the time. Did you know that he has a chipped tooth. He carries around a tube of super glue so every time it comes loose he glues it right back on." - "My son works at the library and at the library the workers have nicknames for all of the regulars. Now, the customers don't know that they have nicknames. The one lady they call Candy because she robbed a candy store and the police found her by following the trail of candy wrappers that she left." - "The other day a lady brought her dog into the clinic that was both blind and deaf. The dogs name was Keller." I buy, sell, and collect. I am not, however, your normal collector. I enjoy the one of a kind, the rare, and most importantly the strange. 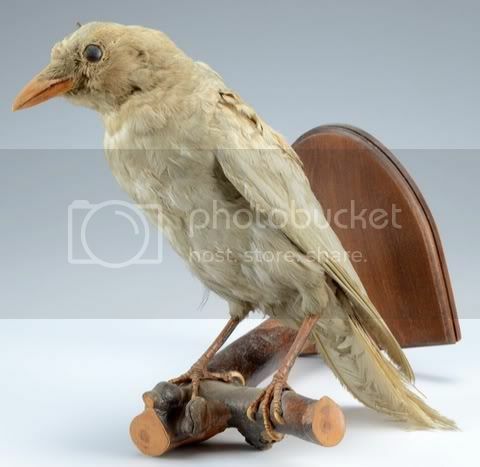 Thus, the newest piece in my collection, a taxidermy, (partially) albino crow. Albinism in birds occurs in only about 1 in every 1800. Albino crows are so rare that when one is spotted it is news worthy. And as rare as a live one is, a stuffed one is even more rare. The Museum of Vancouver has one and there are a few others in private collections. Now, I don't think my crow is worth a ton of money but it is mine and I will never meet another person who owns one. And that's what I like. I think that I finally have a good understanding of what that verse really means. I've heard it my entire life but today I lived it. Yesterday I set a personal goal. Starting today and continuing for the next 6 I will be spending 1 hour a day cleaning my house. And if I'm doing the math correctly, that one hour a day will feel like 14833 human days (41.6 years). I hate cleaning. I love the result but I highly dislike the process. Doing dishes feels like Chinese water torture. There are very few things that I wouldn't rather be doing. After spending an entire hour cleaning today the result is nearly unnoticeable. 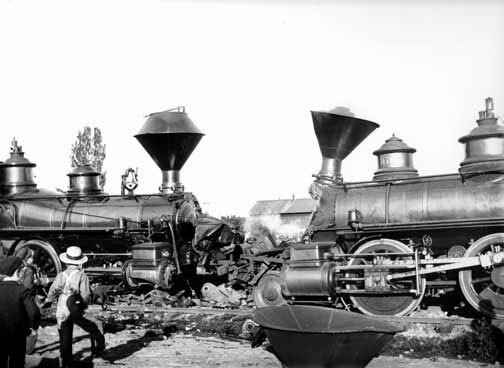 Imagine if you will that a train with a 100 cars derails and 99 of them are destroyed. To the casual onlooker this wreck would look like a 100% loss. If, however, you're BMW was being transported in that last, undestroyed, train car you would see things quite differently. That's how I feel about my house. Granted, it still looks horrible but I have a vested interest so I can still see a difference. One hour down 88989 days to go. So I was thinking the other day, if I lived during the times of the Old Testament what kind of insults would I use. Now, I must warn you, if you don't have a running knowledge of the Old Testament most of these will not be funny to you. Shoot, if you do have a running knowledge of the Old Testament they may still not be funny. What do I know. Here goes nothing. - Your Momma is so fat that after the walls of Jericho fell down, the children of Israel marched around her for the next 7 days. - Your Momma is so poor that she tried to give one pigeon as a sin offering. - When you were born you were so ugly that your Momma tried to become a follower of Molech just so she could get rid of you. - Your Momma is so poor that she collects 10% of other peoples crops. - Your Momma is so fat that she made the king of Moab look skinny. - Your Momma is so dirty that Moses told her she would have to sleep in her own tent for 7 years to be ritually clean. - Your Momma is so old that she is listed in the first paragraph in the genealogy of King David. I love chicken and growing up we ate a lot of it. Chicken was the meat of choice. You can prepare it in a million different ways and most importantly, it's cheap, or at least it was 20 years ago. Of the million ways that exist my family was most familiar with the fried variety. Crispy, oven cooked chicken goodness. As a kid my mom would make one pack of chicken which meant that there was only enough for everyone to eat one piece. But, that left one extra piece. Every time, without exception, I would ask my dad if he wanted the last piece and he would say, "no, I don't need another piece, you can eat it." As a kid it was a bit baffling. The chicken was delicious and if I was hungry enough to eat a second piece than certainly my dad was too. But every time he let me or my brother eat that last piece. "I'll just eat something out of the fridge." he would say. He never said, "I'm older so I get it." or "I'm bigger so I get it." or "Because I'm your dad. ""You can have it," every time. Over the years that attitude has stuck with me. If one of the kids wants the extra taco, or half of my fries, they can have. I don't even think twice about it. Why, because that's what my dad did. I guess I now understand why he always let me have the last piece of chicken. Who gets your last piece?